Responding to Market Share Myth 2007: iPod vs Zune and Mac vs PC and Market Share vs Installed Base: iPod vs Zune, Mac vs PC, readers wrote about Bayesian probability, NPD’s tricky numbers, more bad news for the Zune, sales of the next generation game consoles, Paul Thurrott’s irritation with reporters and facts, iPod life spans, and comments by Om Malik on the growth--or lack thereof--in Windows Mobile market share. After presenting why market share numbers can’t “speak for themselves,” the first article dangled the cliff hanger: "is there a more accurate way to look at markets than consulting heavily massaged market share numbers that jump around erratically in a dance that appears to be performed for the benefit of Microsoft?" Reader Irvin Shizgal wrote, "What you are talking about is essentially Bayesian probability, isn't it? That's very tricky, and most people don't understand it. My degree is in math (but not statistics), and I find I have to be very careful indeed if I try to follow an argument based on bayesian reasoning." Alas, no. I’m afraid I couldn't even make it though the Wikipedia article on Bayesian probability. Although I do benefit from the principles behind advanced spam filtering and I like to shave with Occam’s razor, I am sufficiently challenged by algebra. When taking a crack at deducing a ballpark estimate of how many Zunes Microsoft had sold in January, I was careful to word it: "based on NPD’s numbers and my math, it would appear Microsoft sold $7.2 million in Zunes in January via retail outlets, which at $250 each would be just short of 29,000 units." David Dennis wrote, “It's unfortunate these [NPD] figures are not given in units. For your math to be correct, the average selling price per MP3 player has to be about $250. This segment is purely MP3 players, not hard drive MP3 players, so in reality the selling price is probably about $150-175. If the average selling price is $175, then 1,287,361 units were sold. If we assume 3.2% of those were Zunes, that would mean they sold 41,195 Zunes. “Of course this makes very little difference, really. Let's say Microsoft started selling the Zune during the holidays in late November-December, and that they sold 80,000 during that popular period. Then they sell 41,195 Zunes a month from January-May. That means the most likely Zune sale count is 285,975 [by June 2007]. “Ouch. There are flops and there are flops. Until I wrote that number I had no real idea of how catastrophic the Zune was. It really merits your Hindenburg picture. How Many Widgets in the Pie? Those tricky NPD folks: market share is reported by units sold, but the total number of units isn't listed, only the dollar amount of the market. That tells us as little as possible. If NPD reported the total number of units, or also supplied share in terms of dollar value, we could actually draw significant conclusions based on facts. We could also compare NPD's statistics against real sales, and gauge how valuable NPD's reports actually are. As Dennis points out, estimating an average selling price of $175 gives us 1.2 milion MP3 players in the market sales NPD reports. But we also know that Apple itself has sold around 3-4 million iPods itself in January 2007. Wall Street generally estimates Apple will sell around 10 million iPods in the January - March second fiscal quarter of 2007; Piper Jaffray analyst Gene Munster estimates Apple will sell 11-12 million. Interestingly, Munster's numbers are extrapolated in part from NPD's reports. His estimates were close last year. That tells us that industry analysts know that NPD reports only a narrow slice of the market. If NPD only counts around a quarter of Apple’s iPod sales, does it also miss three quarters of the total number of Zunes sold, or is the Zune simply not selling as well in non-NPD channels? We can only guess. NPD talks about Apple's 72.7% market share in relation to the 1.2 million music players sold in retail stores that NPD knows about. Since Apple really sells three times that many, what is Apple's real share? That seems hard to determine, as market share groups keep the most interesting details a secret, and only feed us headlines. We know that NPD only reports retail sales--no direct sales or online merchants--but it's not as clear how much of retail sales it knows about. It does not include Apple’s own retail stores, for example. KC writes, "NPD numbers also do not include WalMart (or walmart.com) and several other retailers. I don't have last year's figures in front of me for 2005 (2006 probably won't be out for another couple months) but in 2004, WalMart was second in consumer electronics sales at $12 billion, Target was sixth at $3.9 billion, Costco was ninth at $2.2 billion, Sam's Club tenth at $2 billion, and Amazon was twentieth at $800 million. "From TWICE (This Week in Consumer Electronics), the industry trade magazine; this includes all gear including PCs, but clearly there are a lot of numbers / potential numbers NPD is just guessing at." Certainly, looking at retail sales without considering nearly half of the top ten retail outlets would only provide a rough idea of what is actually being sold by retailers, let alone direct channels. Different retailers sell a different mix of products at different average price points, so trying extrapolate too far beyond NPDs figures is problematic. This provides another reason why installed base numbers, based on manufacturer's own reports, offers a more fair and accurate metric for comparisons than market share estimates.  One reader asked why the Zune was missing from the main title graphic of installed base for the iPod and various existing game consoles. The obvious answer is: perhaps it's not really missing, but just that a few thousand units sold doesn't show up on a chart of 120 million units. Maybe a magnifying glass would reveal something; alas, resolution independence isn't here yet. 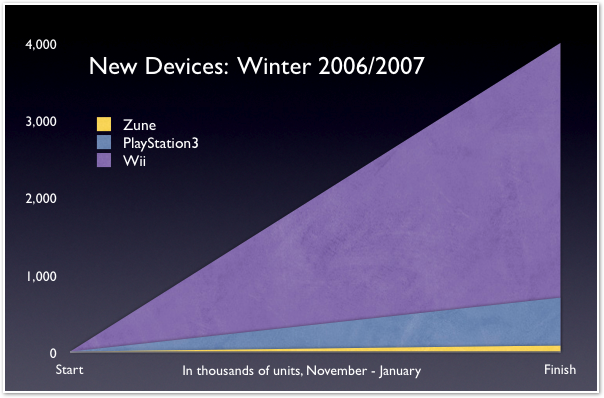 To highlight the difference between the Zune's struggle to sell a unit or two per store every month, and the millions of game consoles and iPods flying off shelves every week, the line version plotted out the Zune with a million unit head start; even with that, it appeared to be stuck at zero. Even the Xbox 360’s 10 million units--many of which are still sitting in stores unsold--only shows up on the chart as a yellow sliver in the corner. Dennis suggested a comparison of the Zune against the new next generation consoles that just came out in the same time, writing, "the most interesting comparison for the Zune might be the Wii. After all, if you try to be fair to the Zune, you must admit that its introduction late last year is a huge handicap in trying to come up with an installed base. "So if you want to compare 'new for Christmas 2006' products, you would show an example of the Wii going from 0 to 4 million in 1.5 months, the Zune going from 0-80,000 in about the same time, and even the much-maligned and horribly expensive PS3 going from 0 to about 700,000 in the same time. In the mean time there would be the iPod's sales for the equivalent time which of course put it way, way on top." Ian Hobson writes, "This is a topic that bothers me a lot. A classic was last year's Forrester survey claiming iTunes sales to be in free fall--or at least interpreted that way. It is actually quite hard to do the work necessary to pull out the real numbers and normalize them, especially if you don't subscribe to certain analyst reports. Well done for this. "Anyhow, my only criticism of the article is that you fail to mention that the market share numbers apply only to the US market which is some percentage of the overall world market. I have no idea what percentage, but my guess is between 25-40% for higher end music players. "Arguably this point wouldn't matter normally if you assumed the US market was a fair representation of the world. But currently, Zune is only available in the US market. Therefore Zune's share of rest of world is precisely zero. Normalized against the size of US market vs rest of world, this brings the Zune market share figure down even further. Is that fair on Zune? Perhaps not. But as Apple continues to open up leads in other countries, it becomes harder for Zune to make inroads when it does become available." That's a good point because Apple's share of the PC market is always presented by Windows enthusiasts in terms of worldwide market share. Those same individuals only ever talk about the Xbox and Zune in terms of US market share. Why? 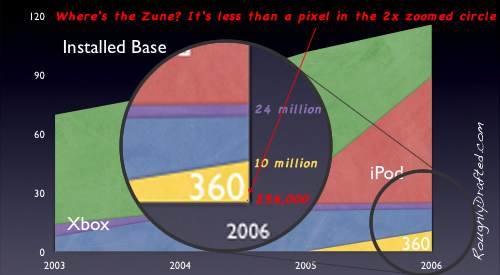 To suggest that the Zune has a share of the US market that approaches the Mac share of the entire world? What point is that? 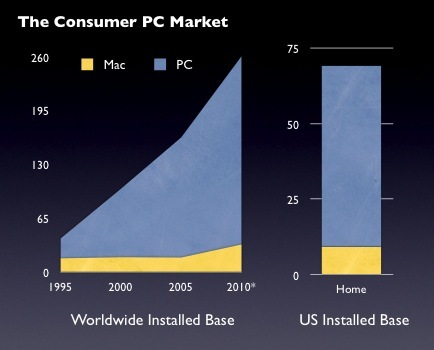 Apple's US share of the PC market has been over 6% for some time, and of course that relates to a much larger market. Comparing percentage numbers between markets of different size, unit price, and product mix is beyond meaningless. Further distilling Apple’s share of the consumer market explains why Apple gets so much press and software support from developers. It is comical to watch columnists who have made a career out of denigrating Apple for its small worldwide share of the overall PC market now spin their gears furiously in the opposite direction in efforts to explain how careful editing is required to correctly represent the health of Microsoft's own hardware offerings: only count US sales, only sales from specific channels, and only factor in competitors with identically priced models. Clearly, one can be a disingenuous fraud without getting involved in politics. Wilf Wilson writes, "It looks like Mr Thurrott here may have been reading your articles on him." Well yes it does, but apparently he's only skimming, because he didn't catch the part about anecdotes. Paul: it's not just a dirty word you can throw around to denigrate writers and suggest impropriety when none exists. Thurrott took issue with the Wall Street Journal for relating "anecdotal stories" about a University moving exclusively to the Mac platform. He also complains that, "as is typical, there's no real data in the article," only to state in the same paragraph that the writer used "some US market share numbers." Surely that qualifies as data? No, he explains, because US market share numbers "are always more positive for Apple because the US is the richest country on earth." The wow starts now. Since that baloney was all directed at the WSJ, imagine what scraps of contempt he had to offer for my presentation of why everything he bases his rhetoric on is simply a contorted, self-delusional fallacy. After browbeating the WSJ for not reporting facts and relating "anecdotes," he writes, "my guess is that the installed base numbers are pretty good for Apple (that is, higher than 2.4 percent, but, say, lower than 5 percent), even more so in the US. But there's no accurate way to gauge that, so my opinion is no more valid than anyone else's." Actually no Paul, there is a more accurate way to gauge that, and your opinion most certainly is less valid because you simply made it up without citing any sort of data, factual basis, or rationale. It is an anecdote you related to pacify your Microsoft beholden audience, largely dependent upon Windows for its collective incomes. Unfortunately, making things up in an effort to ignore reality is not an effective way to find the truth. Good for the Gander: What About iPod Life Span? 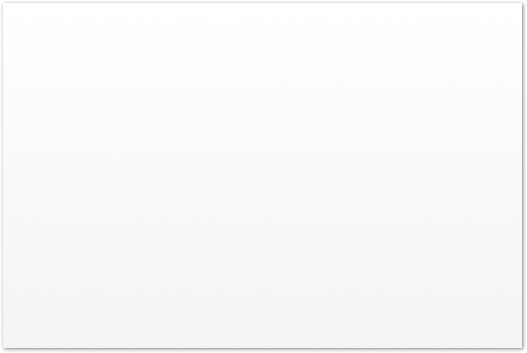 Spencer Cheng writes, "While your analysis of Mac installed base is pretty bang on IMHO, the installed base of iPods is probably high for the very simple reason that the batteries in iPods only last 2-3 years. After that it is either surgery or buying a new iPod. I would guess the total number of active iPods would be equivalent to about the number of units sold over the last 3, maybe 4 years." Martin Pilkington similarly observed, "I just finished reading your market share vs install base article and I think you need to mention one thing with regards to the iPod. If we count install base as products still in use, then both the Zune and the iPod aren't really in the same league as the consoles. The consoles can last 3+ years without people replacing it, however MP3 players generally last 18-24 months. As such, actual install base figures would be less with regards to consoles, but with relation to the Zune, your argument would still stand (though in all fairness, we haven't seen an update to the Zune yet or seen anything about the Zune life cycle, though it wouldn't be too far fetched to assume it's similar to that of the average iPod)." And Paul Messina wrote, "I thought it was an interesting article, but I wanted to add an addendum. Just as you suggested that the market share for Apple is higher than commonly perceived because macs remain in use longer than PCs, the reverse is true for iPods. iPods are fashion accessories, and as such have a very short shelf life. Many people I know are on their third, fourth, or even fifth ipod, only one of which is still in use. 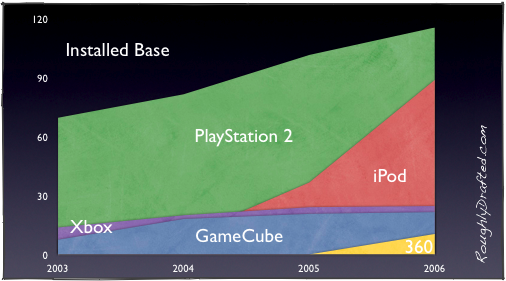 The installed base of iPods is significantly lower than the number that has been sold in the past few years. I don't think it's a big enough difference to significantly change the point you were making, but it should be noted nonetheless." All good points: it's true that iPods don't last for 5-10 years like some Macs have, and the most significant portion of the iPod is its internal hard drive, which typically lasts for only three years of normal service. While computer users can replace their hard drives--the most fragile part of a computer--and keep running with a new drive, doing the same for an iPod is not always worth it. Batteries also wear out, and unlike laptops, it requires some significant extra work to replace the iPod’s battery. However, iPod sales have grown so rapidly that only if we look at the last two years of sales, the numbers don't really change. Less than 3% of iPods--2 million of the over 88 million sold--are over three years old. Further, only 8.9 million--around 10%--are more than two years old! Scraping that fraction off the installed base chart results in a very slight difference. The number of new iPods sold since sales were last officially reported is actually five times higher than the number of iPods that are more than three years old. Life span also has an impact on other devices. No doubt some of the six year old PlayStation 2 units have since stopped working; performing a life time adjustment against the PS2, Xbox, GameCube and other devices would have more of an impact relative to the iPod because sales growth of those devices has slowed dramatically across the board. Rather than eliminating dead iPods from the installed base figures, an estimated life span factor would only distort installed base in ways that exaggerate the position of the iPod, and could be considered unfair and misleading, so the chart represents manufactures' numbers without any modifications. "Why do some people have such vitriolic responses to such a benign article? How have some people come to have such a strong negative emotional response to anything related to Apple? I fail to understand the hatred that Macs seem to inspire in the computer tech community. "I really believe that a lot of self-important IT managers feel threatened by Macs because they have done nothing but spend all of their time and money pursuing their MCSE certifications rather than learning a healthy variety of operating systems and hardware. They're simply frightened of becoming irrelevant. I don't hear much complaining about Macs from the UNIX-savvy guys, probably because they aren't drinking the MS Kool-Aid and they can see what a steaming pile of crap Windows is built upon. "It's ironic that people in the MS crowd call Mac enthusiasts 'fanboys' in light of their extremely hostile and reactionary rhetoric. I think they're the ones who are in a state of mass hypnosis, ever open to the power of suggestion from the Almighty Microsoft. I suppose that group could include industry "analysts" (paid shills), columnists (ditto), IT managers (MCSEs) and self-professed "computer experts" (Windows hobbyists)." 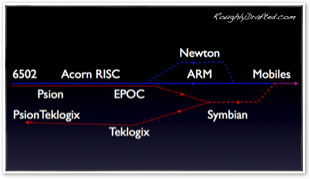 Dan Koeppel writes, "Om Malik today writes about the way mobile phone makers are consolidating their OS choices. As proof, he links this phrase to a NY Times article: 'Of course with Windows Mobile growing like crazy – the second-fastest growing mobile phone OS,' but the article he links to says exactly the opposite!" From the Times article: "Last year, two-thirds of smart phones sold ran on Symbian’s operating system, an increase of about four percentage points from 2005, according to Canalys, a consultant and market research firm based near London. Microsoft was second last year with a 14 percent market share, slightly less than the year before." Perhaps Malik was hoping that readers wouldn’t check the Times link because it requires registration? Poor Om; if it can’t compete with Symbian, imagine how fast it will fail to grow once the Windows Mobile Killer arrives!